If you're ready for something truly different, try the following lodging options on your next trip. If you're visiting Europe, why not get the full experience by sleeping in a castle? Castles have opened their doors to curious travelers who want to live like royalty and nobility used to. On some castle grounds, guests can even spend their days horseback riding, practicing their swordplay skills, and watching knights joust. The interiors of these castles are often furnished with appropriately antique-looking items. But despite the old-timey vibes, the facilities have been updated with modern fittings. Staying at a castle is a fun way to incorporate history into your trip, especially if you travel with kids. It's also a great story to tell when you get home. 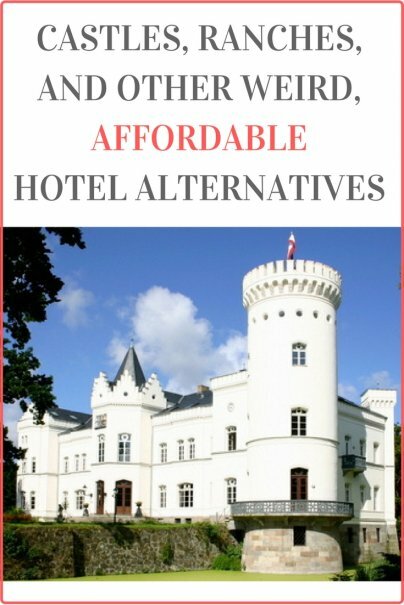 You can often find these castles listed on regular hotel booking sites, but they aren't grouped separately from regular hotels. For a list of these castles, visit CastleandPalaceHotels.com. If castles show you how the elites used to live, monasteries and convents offer a completely different type of experience, although you may still get the feeling that you've gone back in time. You don't have to be religious to stay in these guesthouses; you're usually welcome to stay as long as you respect their rules. Many of the guests may be pilgrims who take part in the masses and communal meals, but attendance is not required. The facilities at convents and monasteries are basic — you may not even get a TV — so ask questions and make sure you know what you're booking. Remember that these are religious buildings first and foremost. You may find crucifixes in the rooms, bedding configuration options are often limited, and there may be curfews. These guesthouses are not run for profit, so they're a great option for budget travelers. However, on the flip side, they are not listed on booking websites, so you'll have to do some sleuthing. If the place you'll be visiting is a common pilgrimage site, contact the local tourism office to find out if there's any religious guesthouse where you can stay. If you're one of the urbanites who sometimes fantasize about living on a farm, this is your chance to get a taste of it. However, your experience can vary wildly, depending on the particular farm. If you'd rather pay for the farm stay and relax, you have many options, including bed and breakfast inns, dude ranches, and cottages. These farms are usually independent, family-run establishments that you can find through the local tourism offices. University dorms usually remain empty when there are no classes on campus, but there are some colleges that rent out these rooms to travelers. You can usually rent a dorm room for as long as three months — the length of a normal summer break. Living on campus can be an enjoyable experience. Many universities have libraries, museums, and gardens that you can visit. While usually spartan, a college dorm has all the basic amenities and is usually surrounded by shops and restaurants. The rooms vary widely depending on the particular building. There are all kinds of bedding configurations, some rooms have ensuite bathrooms, and some dorms even provide breakfast. Not all cities have college dorms where you can rent a room, so do your research before the trip. You can find and book these rooms on UniversityRooms.com. Camping on someone's yard can be a great budget option if you like being in the great outdoors. You can often do it for free. For example, a man I met on a Greyhound bus told me that he was on his way to a family reunion and that his brother was attempting to reach the same destination by bike. His brother would cycle during the day and camp in people's backyards during the night. "You'd be surprised how kind strangers can be if you'd only ask," he said. Granted, it takes a particularly adventurous traveler to attempt that kind of journey. If you're interested in the idea but want to connect with the homeowners beforehand, you can find them online through campinmygarden.com. Some of these homeowners will let you stay for free, but most will require you to pay a small fee. You'll most likely have access to basic amenities like bathroom facilities and electricity. Some homeowners may even provide you with camping equipment and breakfast. What's the most adventurous place you've stayed while traveling? Please share in comments! I can personally vouch for the religious guesthouse option. I stayed at a Mennonite house for $36 a night(including breakfast) in Washington DC. It was lovely and quiet and I saved a ton of money.